The word “sushi” doesn’t refer to fish at all—it refers to rice that has been seasoned with vinegar, sugar, and salt. This delicious recipe is a great addition to a summer dinner! Making sushi is much easier if you have the right tools and ingredients. SUSHI RICE -Look for “sushi rice” on the label, or visit a local Asian market for the best selection. Vegetables like carrots, cucumber, avocado, radishes. Thinly sliced. Add 3 cups sushi rice and 3 1⁄4 cups water, to the rice maker and cook. When rice is done cooking, prepare the sushi rice vinegar mix. This is what gives sushi rice its distinctive taste. Rice vinegar mixture = 1/3 cup rice vinegar and 3 TBSP sugar. Over low heat mix until the sugar dissolves. Let the mixture cool. Take vinegar mixture and sprinkle it lightly in small amounts over the rice, and mix. Place water and a splash of vinegar or water in a bowl so you can dip your hands when assembling your sushi. This will keep the rice from sticking to your hands, one of the biggest issues for rookie sushi makers. Cover your bamboo mat with plastic wrap to prevent rice from sticking to it. Position a half sheet of nori shiny side down on your saran covered bamboo mat. Dip hands in the vinegar water mixture to prevent sticking. Make a groove along the length of the rice and lay a thin layer of vegetables on top of rice on the bottom third of the nori. Begin rolling your sushi roll by putting the tips of the four fingers of each hand on top of sushi ingredients to hold them in place while keeping both thumbs on the back of the bamboo rolling mat closest to you. Push the mat forward until the mat is completely around the sushi roll and until the top and bottom edges of the nori meet. Pull your four fingers out from the mat and roll. Continue to roll the sushi mat in a circle around the ingredients. Avoid pressing too hard. The mat can be used to shape your sushi into a nice long, round roll, but be gentle or you’ll have a heavy rice log. Seal the end of the roll by using a little bit of water to wet the nori. Set your first sushi rolls on a plate. Let them set for a few minutes prior to cutting. 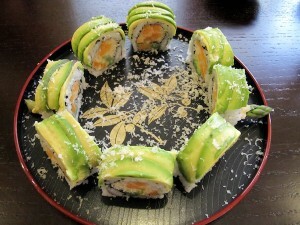 To cut your sushi roll, place one sushi roll on your cutting board. Using a very sharp knife, gently cut each sushi roll in half, cutting down and through. Wet your knife after each cut so it doesn’t stick. Place the two halves above and below each other, and cut each section into three pieces, leaving six bite-sized sushi morsels. Place the sushi on a plate. Repeat until all of your sushi rolls are cut into bite-sized pieces. Enjoy with soy sauce, wasabi or just plain! Chopsticks and fingers are both acceptable for eating sushi. Bite-sized sushi should be eaten in one bite. Never pass sushi from your chopsticks to someone else’s chopsticks. This is considered bad luck. Japanese tradition calls for an odd — not even — numbers of ingredients, usually three or five items.